Tenacity. Trust. Triumph. A Government Library's Story. Here at Springshare, we love a good challenge when it comes to helping a client library be the best it can be and impressing their own users with the level of online services they provide. When the said library has on its staff someone as awesome as Ken Winter – who puts our tools to masterful use at Virginia Department of Transportation (VDOT) Research Library – the ultimate success is all but guaranteed. VDOT is one of our early Springy adopters among Government Libraries. Our aim is to replicate VDOT’s success to the thousands of Government Libraries out there. Ken explained, "Our parent agency, VDOT, is responsible for building, maintaining, and operating the roads, bridges, and tunnels in Virginia, with a 2017 annual budget of $5.35 billion and a workforce of about 7,500 full-time employees. VDOT operates the third largest state-maintained highway system in the country." Their library serves researchers and graduate students, whom he referred to as super users because they are professional researchers. However, Ken stated, "...we also serve agency employees in 9 districts throughout Virginia and those employees are increasingly mobile." Are these the challenges? We have the What and the Who, but the challenges come with the How hard is it? They're locked behind an agency firewall. The VDOT Research Library is up to the task, though. If you know the name of the monster you can kill it. Ken boiled it down, "...we need to find ways to serve customers and stakeholders at other Virginia agencies, universities, and in the private sector, not to mention residents of Virginia, so library visibility and accessibility are huge challenges for us." This had to be solved and so they went looking for a solution and found Springshare tools. Ken said, "It is hard to stay relevant when you are invisible to your customers! Until Springshare, our Web-based catalog was the only evidence we existed." Springshare products are flexible and modular, so we only purchase what we need and with a little imagination we are finding unexpected wins. Because Springshare products are adaptable, the more we use them, the more uses we find for them. Because they are affordable and so well integrated, we are exploring additional Springshare products well beyond LibGuides most commonly associated with the company name. We feel like we’re in good hands with exceptional customer support, negligible down time, and product enhancements that give us more value for our investment than with other vendors. We rely on virtual and recorded Webinar training and appreciate the constant product improvement. When we have questions, support personnel are there to help and when we make enhancement suggests Springshare really listens, which makes it feel like a team effort. Mobile first and compliance with accessibility standards allow us to focus on content, not on code, which our staff wouldn’t know how to do anyway. A leap from the intranet to the internet. 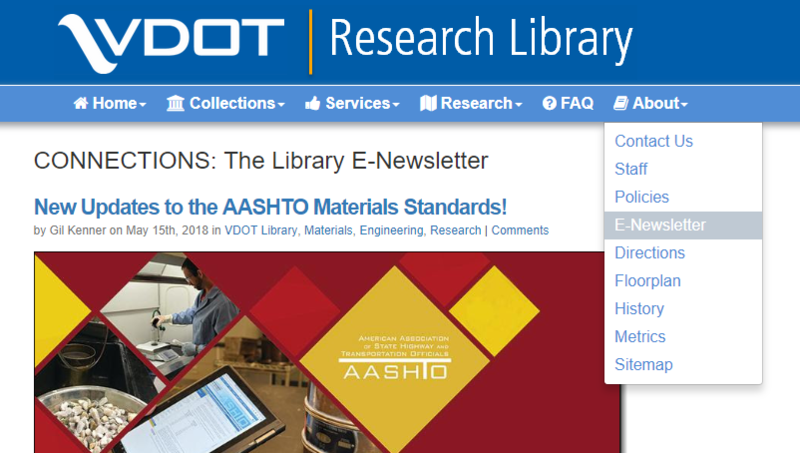 The VDOT Research library started their Springshare journey with the goal of integrating LibGuides and the LibAnswers Platform into their intranet. It didn't take long for them to realize that if they upgrade to LibGuides CMS, they could actually go beyond their original modest use to powering their whole site as well. They took full advantage of the free training sessions Springshare offers and learned it was free to consult the support team, which they did, as necessary, and learned the benefits of having LibWizard Lite, included with the LibGuides CMS upgrade. We believed we could configure a presence our IT and Communications groups would accept and our patrons would adore. By 2016, they established a VDOT Research Library website and had their IT team push a custom desktop shortcut to 5,500 VDOT desktops. Do things they always wanted to do, like have a Newsletter. Do things they didn't think they would do, like Cross-Promotion. And, do things they absolutely had to do, like the Quarterly Report. For years, Ken and the librarians wanted to have a weekly E-Newsletter. Their motivation was to use the LibGuides CMS blog feature to share new resources and publicize cool guides they had built, write about general library information and highlight research news. Ken confessed, "We are not super social, but we do cross-post a version of all blog posts to LinkedIn to drive traffic back to our site/guides/blog, and just learned how easy it is to simultaneously promote new guides or blog posts to our personal Twitter pages." The VDOT Research Library is actively doing more Promotion and Cross-Promotion now because, as Ken said, it's "...faster, easier and more effective..." than using their agency's tools. The functionality is built in. The State Agency has a couple of options for them but they prefer to use LibGuides CMS, which gives them full control. The Quarterly Report - Chore no more. The Quarterly Report and all such aggregations that need to be shared can be a real nuisance, but they're non-negotiable. You have to deliver them. At their best, they're useful and help you be transparent and share successes and goals. Sometimes, however, if something is hard to put together... it doesn't come together and leaves people with more questions than answers. Ken said, "Our quarterly report, once laboriously compiled by staff using Microsoft Word and Excel data later merged into an Adobe Indesign template, has been re-imagined as a LibGuide. Same look, same feel, same functionality. But now it’s a guide each department head contributes to directly using point-and-click elements of the rich text editor, so no special software is required." Their department heads can spend their time on other projects as LibGuides CMS made this one a breeze. 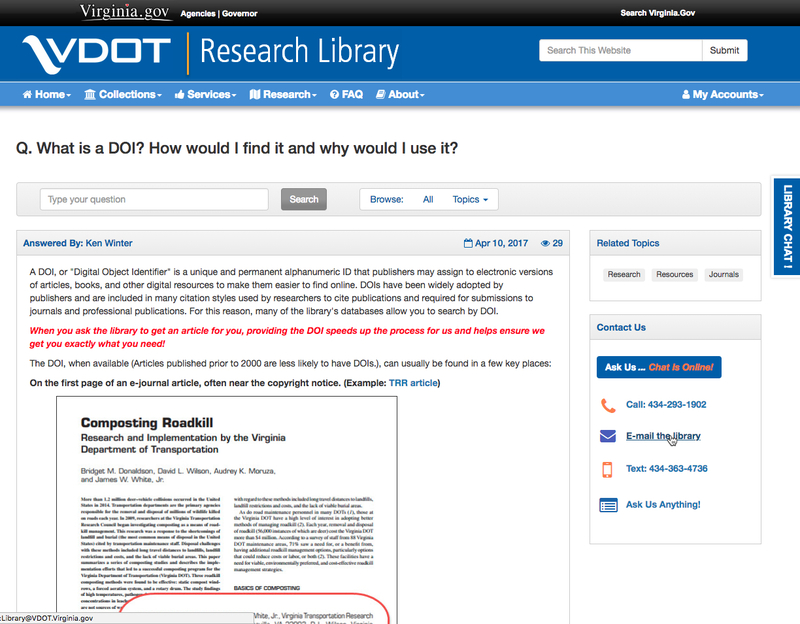 Providing an effortless way for the public, researchers, students, staff and librarians to interact, ask questions and get answers is a welcome priority at the VDOT Library. Because Security is such a focus, many don't have administrative rights to their computers and browsers are locked down. People need help. But, while the library has a small staff that relies on having to hand work back and forth, they have managed to use Springshare tools to boost interactions. For the patrons, they created a number of specialized submission forms and also surveys using LibWizard Lite. You'll find them in various places on the website, within guides, etc. They've even used them for standards like Get a Library Card and as the Document Request Form. 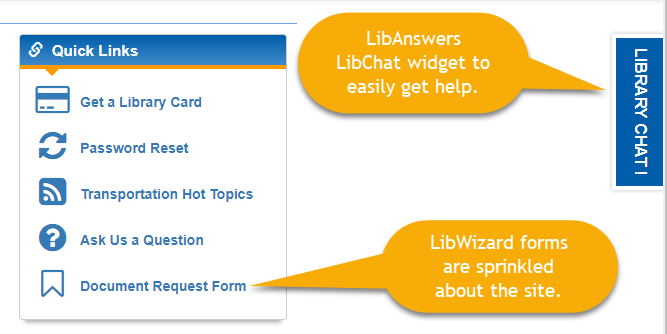 Additionally, they've placed the LibAnswers LibChat widget just about everywhere anyone might have a question to ask. 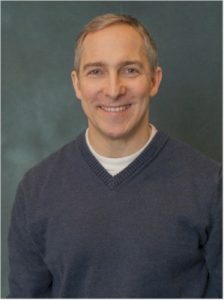 Ken shared that, "We utilize chat widgets on most of our databases, catalog, federated search and remote authentication and we even got chat widgets to work in SharePoint." Internally, Ken and his colleagues are having more fun. Access to LibChat / LibWizard forms throughout. We do our best to be self-sufficient, but truth be told we rely heavily on the Springshare support to help us get “over the hump” when we need advice on code tweaks or have a question about product limitations or “best practices.” We also rely heavily on the Springshare Community sites, the Springshare Blog and Buzz Site to keep up with community news and product enhancements and we enjoy peer-to-peer discussions through the Springshare Lounge. The long arm of the LibAnswers Platform. The LibAnswers Platform in the complete virtual reference solution. The VDOT Research Library stretches the LibAnswers arm so that it reaches into the corners of their imaginations. They use the Reference Analytics to collect transactional statistics for their Quarterly Report. They have a busy staff so it's important to have something intuitive. Ken states that it is "...so well integrated with other Springshare tools that we are now able to more accurately show management the quantity and quality of the work we do and track how we are serving our customers—including pockets that may be underserved." They use FAQ widgets both internally and externally on their sites to keep page content fresh and relevant. They have a manager who acts as a secret expert in a phone-a-PhD friend capacity. The VDOT folks get a lot of unique, highly technical questions from other agencies and researchers. This manager monitors the dashboard in Away mode and, upon consult, she advises the librarians via internal notes. We did a "trust fall" into Springshare's arms in 2015 and boy did we get caught. Ken wanted to share his thoughts on what the best part is about being a Springshare customer. Being a part of a global community of Springshare clients and feeling like we’re not customers of a vendor, but library professionals working together. When I look at what a humble little state agency library like ours has been able to accomplish in a short time, short staffed and short of technical know-how, Springshare has far exceeded our expectations and is one of the best values we have ever invested in. Springshare products and customer support have allowed us to reimagine what our library can be. The more we use Springshare and the more we see how other libraries use Springshare, the more ways we find to use Springshare, and that is exciting and fun! 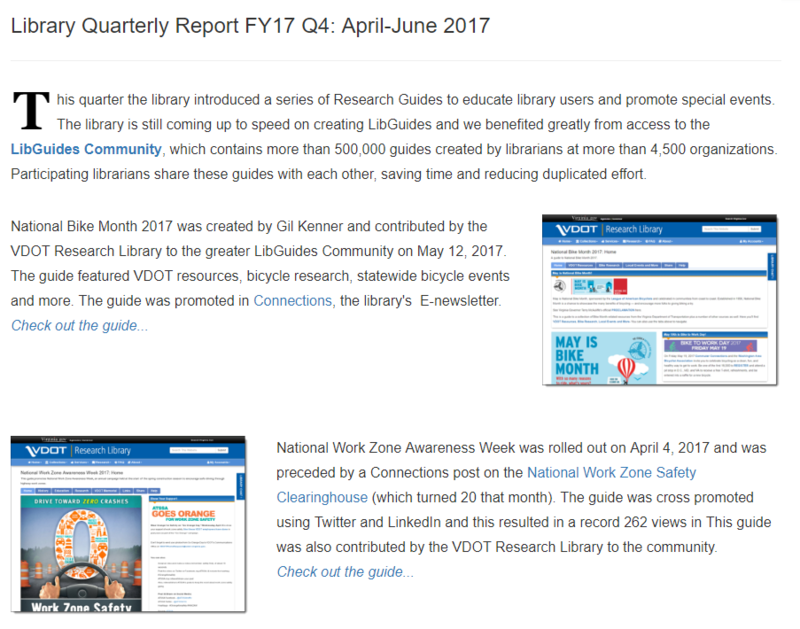 Springshare congratulates the entire staff of the VDOT Research Library for winning Employee of the Year for implementing LibGuides CMS and LibAnswers and for creating, in the VTRC research Director's words, "an agency website that actually works."